For the past two days, rumors have been swirling that Metal Gear Solid bossman Hideo Kojima will be parting ways with Konami in the near future. Today, Konami issued a statement that seems to imply the rumors are true: Kojima will finish up MGS V, and then Metal Gear will continue... but they're looking for new "main staff to lead the development." Konami has been frustratingly opaque about Kojima's future with the company since news broke yesterday that the Japanese publisher is doing its best to strip all mentions of the director's name from their websites and box art. Exacerbating these rumors was a GameSpot report that Kojima is indeed going to leave the company in December, three months after the scheduled release of The Phantom Pain. 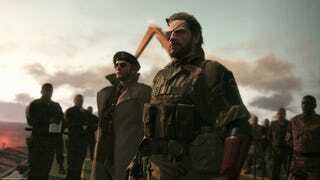 The GameSpot report is based on the word of a single anonymous source, so it needs to be taken with some skepticism, but it's damning: "Power struggles between Kojima Productions and Konami have convinced the publisher to make drastic changes, including amending the employee status of its Metal Gear team," they wrote. The latest title in the METAL GEAR series,"METAL GEAR SOLID V: THE PHANTOM PAIN" (below, "MGSV: TPP"), will be released as planned starting on Tuesday, September 1st, 2015 in North America, Latin America, and Europe, followed by Japan and Asia on Wednesday, September 2nd. Hideo Kojima will remain involved throughout. Hideo Kojima stated, "I want to reassure fans that I am 100% involved and will continue working on METAL GEAR SOLID V: THE PHANTOM PAIN; I'm determined to make it the greatest game I've directed to date. Don't miss it!" In addition, KONAMI will continue to develop and distribute top-quality content in the METAL GEAR series following "MGSV: TPP." We greatly anticipate and deeply appreciate your ongoing support for METAL GEAR. As the next step in the series, KONAMI has already resolved to develop new "METAL GEAR". In other words, Kojima is going to see MGS V through, and then... who knows? We've heard some scuttlebutt about money issues and other arguments between him and the publisher he currently works for, but nothing concrete enough to report. This statement seems to speak for itself, though. Maybe this really will be his last Metal Gear.